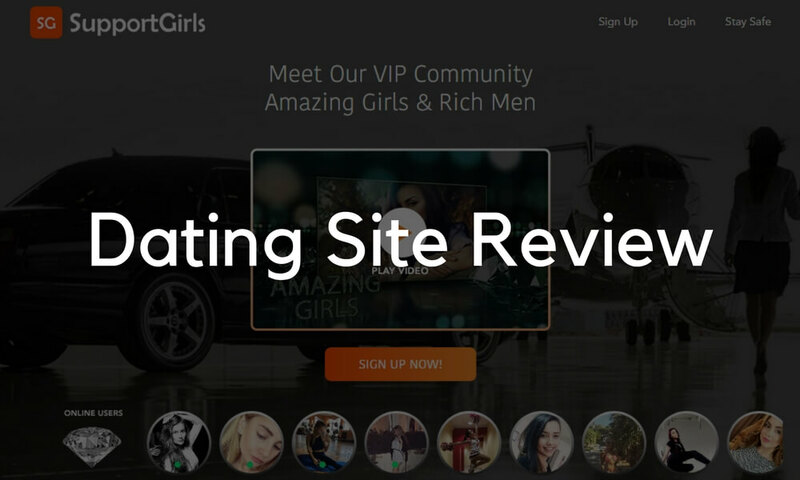 Friends, with this article we hope to start a series of dating site reviews performed by our Experts team. The sites will be chosen at random. The goal is to help people who are new to the online dating business by analyzing design, functionality, and SEO best practices. 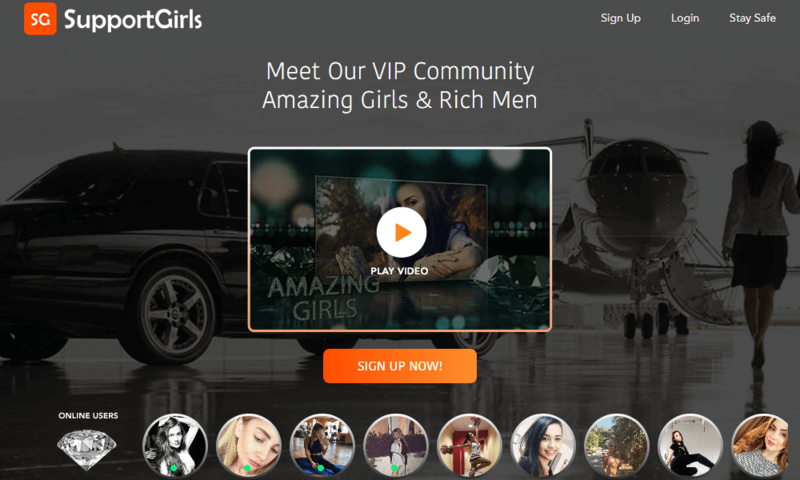 Today we are going to take a look at the SupportGirls.com website. 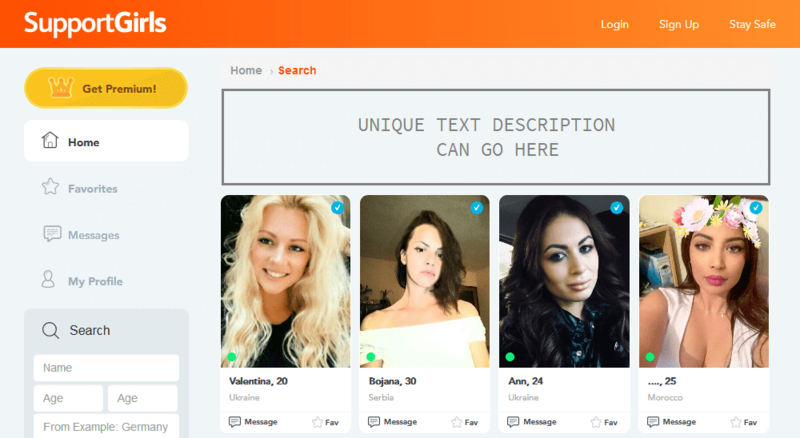 To stand out from dozens and dozens of dating sites, founders choose very specific niches to go into, and this site is a good example of a dating niche. SupportGirls.com is a website where wealthy men and beautiful young girls from all over the world are looking for a short-term relationship. As a rule, when wealthy men travel they would like a young beautiful lady to keep them company. And this site is a place where they can find a companion. search optimization that influences the positions of your website in search results. The main page conveys the website idea from the first glance. It is designed in a simple way where elements are placed in the centre which immediately focuses the visitor’s attention. The colour scheme perfectly fits the niche and makes an impression of a serious service provided by the website. The bright Sign Up button instantly attracts attention while you can also see a carousel with the site members, which raises the interest of the visitor and makes them want to join the site to talk to these people, so it ultimately helps to build up the user database. A short description is placed in the first screen and gets the main site idea across; a nicely shot video brings the interactive element to it, and the background picture serves the main idea but doesn’t draw too much attention. 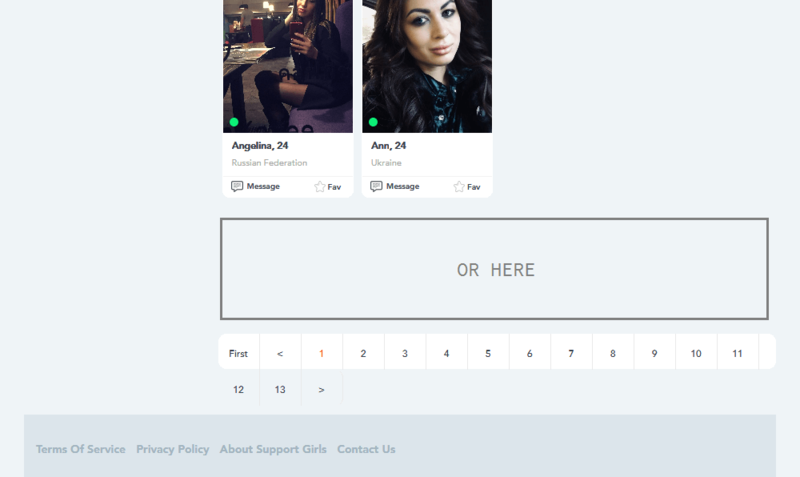 When you scroll down the main page, you can find more details on what advantages girls and guys can have while using the website. The site owners made 2 separate blocks for it which is also good. Mobile apps are a must nowadays and one can download the SupportGirls apps from the App Store and Play Store which upgrades the user experience and adds credibility to the site founders. There are some improvements that we’d like to offer, though. Using stock photos can make your site look untrustworthy. It’s better to use real images or resort to success stories, otherwise, the website looks dolled up and lacks real-life element. We would also advise to create a smaller application block or not to put the download icons in a separate block at all. It’s a common practice to put the apps icons in the footer. Plus, the texts repeat the same info we’ve read above. The block increases the page length which isn’t very good for keeping the visitor’s attention. People’s attention span is usually 3-5 seconds. You want to make your dating website clean and easy to navigate so that any user could understand its logic intuitively. That’s the case with the SupportGirls.com. The profile page isn’t overloaded with information, very simple, and the left menu with the search options is static and easily accessible from any site page. However, we would recommend adding more user information, which can be vital for searching a partner. For now, the focus is shifted to the cover photo that takes up too much of a screen real estate and does not actually let us see the user’s photo gallery—the main attraction—from the first glance. Judging from the site specifics, it would perhaps be advisable to add more details about the user to run the search by (height, weight, etc.). The search offers many indicators, like New users, Online users and Verified users, plus the main information about a person is shown there, too. You can either message a person or save the profile to your list of favourites. The Premium membership is advertised, which is also good for the business as it helps promote premium options that appear to be the only means of earning money on this website. One of the downfalls is a slight confusion when you view a member’s profile, as some of the buttons (Send Message) prompt you to sign up whereas others aren’t active at all (Add To Favorites, Report). We would recommend making all buttons work in a similar fashion so that clicking them in a guest mode would prompt a person to make an action (Login/Sign up). Another point to consider is maybe to introduce a multilingual support as the website is seemingly targeting an international audience. From the search engine optimization point of view, it seems like the works have been started but haven’t been finished. 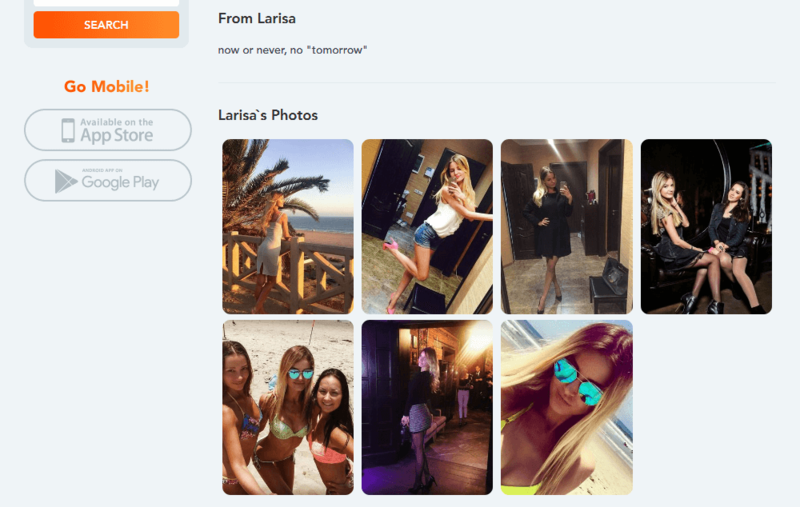 There are links for pre-made search results such as RICH MEN, UKRAINIAN GIRLS, RUSSIAN GIRLS, BEAUTIFUL GIRLS, TRAVEL GIRLS, but the listed pages are identical in some cases (Beautiful/Travel) and there aren’t any unique webpage titles. Also, unique text descriptions for every significant search query can help raise the pages in search. The titles and descriptions help search engines to differentiate the pages and make the search results more precise, while the lack of titles can reduce the traffic and lead to the page’s complete exclusion from the search results. We’ve also noticed that the H1 titles aren’t used for all the pages, though they usually contain the most important keywords that influence your site’s search positions greatly. We’ve now gone through some of the aspects that make a dating website complete and unique, so now you know what to pay attention to. These are the main points we’ve spotted on the website, and if you’d like to learn more or discuss a particular aspect, contact us in our live chat and we’ll be able to guide you through it.